Hygienic Healthy Eva Horse Stable Stall Flooring! Relevant to being part of the equine industry since 2004 - Sherwood Enterprises have visited numerous horse stables that are not only unhealthy for horses, but also for people who work in these indoor environments; However, we must also say we have seen many hygienically clean and well-managed stables. Regarding poorly managed or fit out of stables, most notably was the build-up of urine where ammonia is developed and emitting airborne pathogens whilst the horses are standing or resting. The horses are constantly breathing unhealthy contaminated air which can affect its performance or, more seriously, develops a COPD disease and allergies. Sherwood Enterprises is not only an equine flooring distributor, but we are talking to horse owners and trainers daily. Our UK colleague advised of innovative developments in horse flooring, particularly with added comfort and hygiene. So we researched further in the United Kingdom, Europe, and Canada for stable stall flooring that would provide additional feature benefits for horse and human well-being when working in indoor stabled environments. 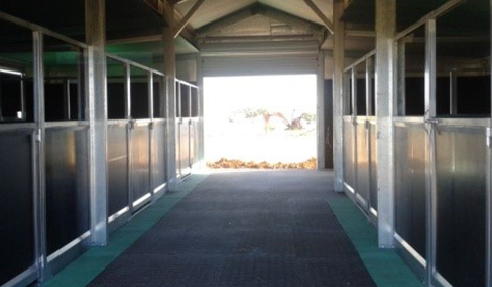 In Australia today, we have clients that are most satisfied with our Eva Rubber Horse Flooring that's easy to handle, reduces the use of horse bedding by up to 60%, provides extra comfort, are non-absorbent/waterproof, urine/bacteria Resistant, reduces dust, non-toxic, and virtually no VOC off-gassing. Eva Rubber Stable Flooring features a teardrop traction surface, thermal insulation better than most rubber floorings, is quick to muck out, and importantly provides interlocking for DIY installation while priced reasonably, plus 100% recyclable at end of life. Sherprise high-quality Eva Rubber Interlock Horse mats deliver the feature benefits above and contribute to a healthier stable environment. Once you purchase and install with a regular regime you will see in due course a happier, healthier horse, able to perform at their best. They can rest well in a stable environment with extra engineered comfort and Eva memory micro closed cell plus rise from a hygienic stable stall floor with no more capped hocks. We stock Item 4001 - 1830 x 1220 x 24mm thick interlock and Ultra Comfort 1830 x 1220 x 34mm thick Interlock Horse Eva Rubber Mats. Please visit www.sherprise.com.au for more information on hygienic Eva horse stable flooring today. Disclaimer: The above is purely Sherwood Enterprises' own observations in the equine industry regarding indoor stables where hygiene is a concern.